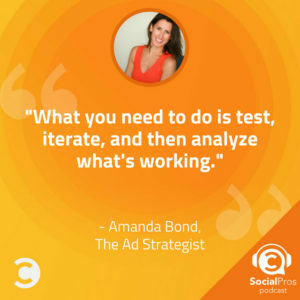 Amanda Bond, Owner of The Ad Strategist, joins the Social Pros Podcast to discuss building audiences, organic posts, and Facebook ads. With every announcement regarding Facebook’s newsfeed algorithms crippling businesses further, it is no wonder many marketers are declaring that organic reach is dead. Paid Facebook ads seem to be the last remaining foothold. Amanda Bond of The Ad Strategist not only disagrees about organic reach, but actually believes that organic posts can provide crucial information that makes your Facebook ads more successful. Of course, organic posts do not go as far as paid. But they are the perfect place for testing and developing your social strategy. If you consistently apply your strategy to your organic posts and measure response in the same way as your paid ads, the analytics and feedback you receive can lay the foundation for where to start applying your budget. When you understand what your audience wants and how they will respond to your content, you’ll use your money more effectively and create real engagement with your customers. How to bring your organic and paid social content together to enhance the customer journey. Why organic reach on Facebook is not dead. How to conduct testing with organic posts to be amplified through paid. How to use Instagram Stories to promote sales with a more human experience. Why consistency helps lay important groundwork for larger ad campaigns on social. Keep taking consistent action! It doesn’t matter if you can see the results yet. You have to put in the work and trust that you’re setting yourself up for the future. Amanda sees Elon Musk as one of the great innovators changing the world right now, and she would love to speak with him and hear his perspective on that! Jay Baer: Hi, it's Jay Baer. 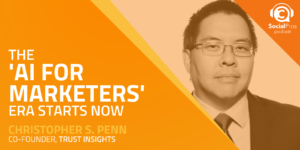 In this week's episode of the Social Pros Podcast is brought to you by Salesforce marketing cloud who have a complete guide for B2B social media marketers that you can download right now. It will show you the best types of content, the best time to post content, the best channels to use, what kind of metrics to use. It is super comprehensive and absolutely free. Go to bitly/socialb2bguide. That's bitly/socialb2bguide all lowercase to download it right now. It's from our friends at Salesforce marketing cloud. Also, the show this week is brought to you by our pals at TechSmith. Man, I use TechSmith tools all the time, Snagit and Camtasia. With tools like these, anybody can create custom screenshots, screen casts, videos. If you're trying to merchandise your results internally and show your boss how great you are at social, you can be using a lot more visuals than you're using today. If you need marketing visuals, but you don't have a production team, Camtasia is for you. It's for folks who don't have video experience. Communicating with visuals is more important than ever. Camtasia and Snagit make it easy. Go to techsmith.com/socialpros. That's techsmith.com/socialpros to learn more. Thanks so much. Adam Brown: Welcome to social pros, the podcast where real people are doing real social media work. This is Adam Brown, your co-host, your man of the hour from Salesforce marketing cloud coming to you live from Austin, Texas. 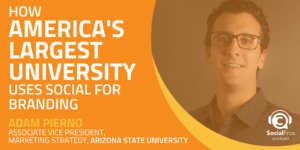 I'm typically joined by the main man of the hour, Jay Baer, but Jay is on his book tour right now traveling across the United States with publicity for his very exciting new book. I hope you're enjoying that as well as I am. But today, even though Jay isn't here, we have a fantastic guest and someone that I've really gotten to know well here as we've spoken before the recording began. Amanda Bond, owner of The Ad Strategist, and really, one of the smartest people in this paid social media and Facebook, Instagram world. Amanda, it is so great to have you on the show today. Amanda Bond: Thank you guys so much for having me here. I love jamming all the real talk stuff about social media and paid advertising. So we're gonna have fun. Adam Brown: One of the most interesting things I think, Amanda, about how you've been working lately is you're transitioning your agency a little bit. You're going from actually doing the social media work on behalf of your clients, on behalf of your customers. Which, of course, you're still doing, but more and more of the work that you've been doing as of late has been about training. It's been about empowering, it's about teaching social media practitioners and non social media practitioners how to be more effective, especially in Facebook. And I'm gonna assume with Facebook, also Instagram. Is that correct? Amanda Bond: Yes, that is correct. Adam Brown: Talk a little bit about how this has all manifested itself, because I think all of us wanna get to know more about social media. There's so many nuances every day, every week. Facebook does the Facebook dance. They change things, they change how they're structuring it. They way that we as marketers, communicators, as social media practitioners measure our success, or lack thereof, in the space has changed. I'm real curious of why you've made this pivot? Is it because Facebook marketing has gotten more complex? Is this because there seems to be more of an opportunity for an organization like The Ad Strategist and a better business model to work on training? Or is it more because more we're seeing the transition from practitioners doing more of the work themselves rather than having their agencies and their consultants do the social work on behalf of them. Amanda Bond: Great question. And I think before I can answer that, I have to zoom out to before The Ad Strategist officially existed and I was a freelance social media manager back in the day. So years ago, I was the person managing all of the social channels and reporting impressions to my clients. "Hey, we had this much reach on our post." "Oh, my gosh, new eyeballs. Amazing." And the clients years ago would be like, "Cool, but how is that impacting our revenue?" 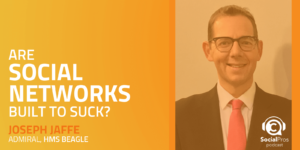 So I went down this rabbit hole of really trying to understand the ROI that you can achieve with social media, getting people through the customer journey into your sales funnels, having these social conversations. And that's what led me to Facebook advertising, that paid media play on Facebook and Instagram because it became less of reporting just on the impressions and more reporting, "Okay, if I spend a dollar on Facebook advertising, here's how much that dollar is turning into." 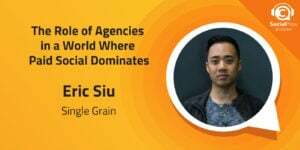 So with the agency, we started to scale in that way, doing ads management for people. And we were getting phenomenal success, multi seven figure launches, Evergreen programs that are running on auto pilot, memberships, products. Everything was going really well, and so I just took the time to slow down and ask myself why were getting such great results. And the answer surprised me because not many other agencies or ads managers were looking at the landscape like we were. It was this marriage of organic social content by taking the time to really understand what your audience wants, and then marrying that with your paid advertising to really put people through that customer journey is what we were doing well. So I said to myself at that time, I was like, "I could continue to take on the small roster of clients, or I could turn around and share this knowledge with people who are actually better advertisers and better social media managers than I am so that they can use that information to get better results for themselves, their clients, their businesses, and their brand. So that was about a year ago that we made the big shift and it's just been incredible to work with people in this new capacity. Adam Brown: This concept, Amanda, of teach a person to fish. Teach a person how they can do this on their behalf is very exciting to me. And I think through at least my whole career in PR and in marketing, what you just articulated is what we've all tried to do. We've all tried to have that ROI that isn't about how many people saw this ad, or how many people liked it or engaged it. But how many butts got off of seats and went to buy something or do something, that conversion. And we've all, I think as marketers and communicators, have said, "Yes, that is the goal. That is what we're trying to do." The challenge has been we very quickly hit a brick wall because we realize I can't do this. I don't have the wherewithal, that tracking that's happening from who hits that green button on a commerce page, to who actually shows that someone came in the store that afternoon, or the next day. That's always been the biggest challenge. So when you sit down and you're training and empowering people to do this, how are you working through that barrier, that wall? And is it because marketers and communicators are getting more comfortable with doing this, or has technology allowed us to actually get to that point, to get to that data set that can show that confirmation, that can show that conversion? Amanda Bond: That's a good one. It is a combination of both, and before I answer it, it's so true what you said. It's that challenge of how do I go from reporting on impressions, the vanity metrics to the things that actually matter, like getting people to take the next action step. 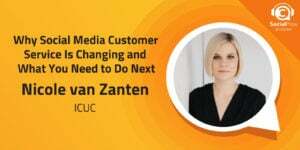 So I do believe it is a change in the industry where people are now starting to talk more on the customer journey. They're starting to really hone in on not just the numbers of things, not just how many page likes you have, not how many impressions your post gets, or how many Twitter followers you have, but really, how many people are you having brand conversations with? How many people are you talking to and getting into a sales funnel through different marketing methods, whether you're getting them on a discovery call, or a webinar, or having them download a white paper. I believe that the industry is now talking about these things in a way that people, they're not so concerned on just the social media side. They're saying, "This is a channel to help us achieve our business objectives while connecting, while being social with our audience along the way." But I do have to say, and I see this time and time again, when you're a social media manager, when you're really responsible for that organic side and then you learn the other side, like when you learn to go for that call to action in that sale, you go full force, right? So it goes from no ROI to only ROI focus to the point where it can hinder you because you're gonna max out the current audience size that you have. And that's why it's important when thinking about paid media, when thinking about your organic traffic, to always be asking yourself how you can grow a larger audience. And so me, as a Facebook advertising strategist, we measure that by our custom audience growth. So those are just the audiences that you can re-target on Facebook because they've had a previous brand interaction with you. If [inaudible 00:09:30] always growing, once you learn to sell, once you're focusing on the ROI, you're not gonna burn out the existing audience size that you have because you're also replenishing and nurturing new people into your community all the time. Adam Brown: And that is so important. One of the interesting things that you've remarked on is the use of both paid and organic. And typically in the old fashioned world, it would be the public relations folks, the comms folks that would own the organic and the paid stuff would be owned by the advertising and the marketing folks. Your talent, your skills, your focus at The Ad Strategist is really on both. And I'm curious how you mix and wrangle that. I know one of the things that we were talking about before the show is you hate the phrase Facebook reach is dead. And we agree, obviously, on that, but I'm gonna slightly adjust that and see if you're still angry about it. And that is Facebook organic reach dead? Adam Brown: Zero percent. Okay, talk a little bit about that because I think that is a preconceived notion that we can't be effective on the organic side. We have to only be able to do things with ad manager and with Facebook pay. Amanda Bond: Yeah, just this whole topic really grinds my gears because there's so many claims that organic reach is dead, reach is dead. But what happens, is people focus on the thought that reach is dead and then they don't put the effort into creating content that their audience base wants. So I always ask myself, "Okay, if an industry is saying something is no longer working, in this case, organic reach or organic content on Facebook, without putting some dollar behind it." I'm not gonna focus on what the average person is doing, I'm gonna find those people who are still achieving success and really look in to why, understand why they're getting higher results. They're getting more engagement, and it actually comes down to that, Facebook as an organic channel. When you create community around your Facebook page, when you focus on engagement, when you understand which posts are giving you the highest engagement rate, there's so many clues to those being really great Facebook ads because there's so many factors that determine our CPM's, the cost to deliver 1,000 ad impression. Adam Brown: So a baseline, if you will. Amanda Bond: Yeah, a baseline. If you know something performs and it's got a 15% engagement rate just by you posting it on your page, you might think to yourself, "Okay, that might make some good ad fodder." Or if it's not that post specifically, it could be the way that it's written in the copy format or the image style that you use. The success from your organic side of the page is going to leave clues as to what's gonna work really well for Facebook ads. But I wanna challenge people that organic doesn't always have to be pure value ad. You can sell organically on Facebook, and when you measure the results of those posts that have a CTA asking people to buying something, when you measure those results and you're like, "Oh, my gosh, I posted organically on my page, it got 50 clicks, and out of those 50 clicks, four people bought." You do the math, and all of a sudden, you're like, "Oh, dang, that organic post had an earnings per click of two dollars." Well, now, you have that data and you can say, "Okay, if I made an earnings per click of two dollars, that means I can go over to Facebook ads, amplify it, and as long as I'm spending per click half that, I'm still profitable." And so by looking at what you're already doing, what's already getting results, one, you're saving time and money not turning things into ads before they're ready. Two, you're understanding what your audience wants and how they really enjoy engaging with your brand. And three, you're just making the decisions that are gonna keep your ad costs down in the future because it already worked organically on your page. Now, once you go to amplify it, you're gonna continue to get those similar results. Adam Brown: I wanna come back to those writing formulas here in a second, because I think that's absolutely fascinating. But I wanna ask you, when you're talking to Facebook marketing and countless practitioners, are you seeing a lot of them, Amanda, who are not doing this almost focus group or test market, if you will, using organic as that test market or that focus group? And then saying, "Okay, everything else being equal, if I throw some money at this, I'm gonna see a greater return." A, is that the case? And B, if it is, that's such a simple concept. It's such a powerful concept. Amanda Bond: I absolutely agree. I'm baffled by it, but you can't fault the practitioners because that's what's being taught in the industry, is set up a lead generation ad, put it out to cold traffic, send them to a webinar and sell something on the other side of it. Well, if so many people are doing that, it's obviously not going to be the most effective, especially as ad costs rise. I did a dissection yesterday of a client in 2016, their CPM cost to deliver 1,000 impressions was $13. Exact same ads, two years apart, it's now $38. So that's a three fold rise in just advertising costs along the way. So there's noise, the industry is teaching people just to do the lead generation. And so going back to what we chatted about before, that this was also one of my motivating factors of me wanting to share why were having such paramount success around focusing on what's already working, marrying that with Facebook ads, and then using your ads. I almost like to think of it like auto responders. You know the auto responder on this date, send them this email? Well, you create that same user experience through your Facebook ads. And so instead of just starting with lead generation like most people do, I highly recommend that you take a minute to look at three different phases of advertising. So we call them connect, commit, close, but it's branding, so the ads that will help you grow your custom audiences, then lead generation. And you're gonna do your lead generation to those custom audiences that have already had brand impression. And then the third one is all about sales retargeting, because if you're already getting traffic to your offers, your sales page, your shops, then it's important to just really help people make better customer decisions in that sales retargeting phase. So with Facebook ads, most people are just focusing on lead gen. They get those leads, they build that email list, and then they're like, "But it's not converting," because they're not understanding that Facebook ads, when you use it as a customer journey, when you see what's already working for you organically, it's just so powerful. Because success leaves clues, you already know what's working, people have multiple touch points with you, and you sales conversation rates skyrocket when it's not just a one and done type of ad in the newsfeed. Adam Brown: I love connect, commit, close. And that is just one, I know you call that the strategy framework. 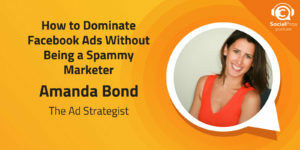 Amanda Bond, owner of The Ad Strategist. I know that's probably one of the pieces of goodness that you train in your classes, in your curriculum, in the activities that you do. How did you come up with all of this? I love pneumonic devices like that. I know you have that, I know one of the other things that we were talking about just a minute before, and I teased up, was these writing formulas and how you've found a way to help people and individuals predict what's really gonna work when it goes over to that paid side. Talk a little bit about that, that writing formula concept. And also, how this all comes together with what you're doing now with The Ad Strategist. Amanda Bond: I do have to caution people, it's not the same for everyone. My audience isn't gonna perform the same as your audience when it comes to those writing formulas. So I always like to remind people it takes time, it takes testing. And so what you need to do is just test, iterate, and then analyze what's working. So going back to what we talking about with the organic engagement rate, posting something organically and then measuring the success by looking at the engagement rate. If you monitor your engagement rates, if you see what posts are really getting people active and involved. And then you start to break down what you're doing in those posts. Adam Brown: Dissect that. Is it why, is it the words you use, is it the timing? Adam Brown: Is it because it's a question rather than a statement? Is it because of some rich imagery, or a video, or a carousel. Amanda Bond: Yeah. What is the thing? Yeah, it's that simple. What is the thing that's the commonality between all those things. My simple one that I use time and time again is statement headline. Something to catch your eye, something that's a little bit polarizing. Then I tell a brief little story, I then get into the meat, the lesson, the hardship that we're trying to overcome. And then I leave a few actionables. Those are always my highest performing posts. And then the engagement rate that we get organically, of course in my head, I'm like, "Let's flip this over to a paid ad and see what happens." And of course, it performs as well. And fun fact, I love doing Facebook ads this way. You know how most ads, they have the rectangle image, the traditional headline with the call to action button. And it just looks like an ad in the timeline. Adam Brown: Yeah, walks like a duck. Amanda Bond: Right. So I personally use those sparingly. And I like to use stealth ads instead. So a stealth ad is essentially a text based ad, so exact same copy that you would use for the image ad, except for this time you're excluding the image, you're just using the copy. Same call to action, same length that people can click, and you turn it into a conversion ad. So you're still optimizing it for a lead or a purchase along the way, but it doesn't look like an ad. It blends into the timeline like a friend would post it. So businesses don't have to look like spammy McMarketersons all the time with these big call to actions and headlines. You can be conversational when you know the copy formulas that work for you. Use that to your advantage and then just turn that into the content that you amplify with that. Adam Brown: And when you do convert that, and this is a little bit tactical, but I think it's really important. So when you find out that something is working organically, is it about using boost and actually throwing money under that exact same post? Looks like, smells like the exact same way, or flip that in the ad manager and do something a little bit more clever with it, or change it around? Or are you saying, Amanda, it's better. If it's working like it is, don't monkey with it too terribly much. Amanda Bond: Right. Now, I am a believer that we don't hit the boost button because it is Facebook's way to make it really easy for advertisers to give them money. So I want people to stop for a minute, really think about this plays out into those three phases of your strategy. Is it branding? Is it lead generation? Is it sales retargeting. Take the permalink, the page post ID. So on your organic post, if you go to whatever the name of the page is, underneath of it, there's a little timestamp. It says, "Posted three days ago," or, "Posted on April 15th." If you click that date, it'll launch into a new window, and it'll give you an ID number. I believe it's 13 numbers long. You take that ID number and you just go into ads manager, set up a campaign like you would for anything else, optimize it for what you're optimizing it for. Meaning if you're in the connect phase and you're trying to grow your custom audiences, you might use video views, or you might use page post engagement because that's the most cost effective way to grow your audience. But if this has a call to action getting you to download a white paper, then this is gonna be a commit lead generation ad, and we wanna optimize that for leads. So go into ads manager, figure out where it fits in the strategy. But then, instead of recreating the ad, just use that page post ID so that any ad set that links to this post, all that traffic is gonna see that exact same post. So every single time somebody likes, comments, or shares it, it's all gonna stack on that original post. So when people come to your Facebook page, because it was organic first, they're gonna say, "Dang, this is a lot of organic engagement this page gets." Because all of the paid traffic is also pointing to that ad as well. Adam Brown: So resist the temptation to just hit the boost button. But do this extra step or two, bring it into ad manager, but don't change the creative. And I love that idea, and that brings me to my next question. Is the consumer getting a little bit smarter about the difference in distinction between paid and organic content that they see in their newsfeed. It sounds like you're thinking maybe there is a little bit because they actually click on something, they actually go to the page. You said look at all this organic engagement, I don't know ... And I don't wanna put words in your mouth, but I don't know if the consumer actually knows that's organic versus paid engagement. But I do think they know there's something a little bit differently. Just like when they watch TV, they know that that's a 30 second ad unit, 28 and a half seconds, somewhere between in the act one and act two of their show versus that product placement that's actually taking place at the show? Am I going anywhere with that? Amanda Bond: I think so. I mean, consumers are smart as all get out. So, of course, they understand what is paid advertising, what is organic. Especially when they're seeing it delivered as an ad impression. So if you post something organically on your page, that's gonna still sit on your page timeline. It's still gonna sit in your post. Adam Brown: Right. Not dark, it's gonna be there. Amanda Bond: Even if you amplify it, the likes, comments and shares that that will get will still stack on that organic post. So if you just visited the page, you wouldn't be able to tell what has been turned into an ad. What the consumer will know is an ad is whenever it says sponsored underneath of it. But this is what I see when people try and go from the organic side without doing the work to see what really resonates. And then they go straight for paid, is they turn into these spammy McMarketersons. I don't know what it is about people writing ad copy, but it just gets really blunt and direct and feature heavy, and you can tell it's marketing. So I wanna encourage people to really take a minute and say, "Am I approaching this from a buy this or do this standpoint, or am I really communicating to the potential consumer, to my audience, why they should take the next step." It's not about us as advertisers, it's about understanding how to communicate with your audience. And again, I keep going back to that organic play. That's why it's so important to know and track all this, and analyze what's working, so that you don't get that spammy McMarketerson voice going on when you start writing ad copy. Adam Brown: Amanda Bond, owner of The Ad Strategist. This is great, great stuff. I wanna pivot a second, we've been talking a lot about Facebook, and see if any of these insights, any of these strategies and tactics that we're talking about can also be leveraged on the Instagram side. We're seeing such a transformation happen over there, and I know a lot of the training and a lot of the education, and a lot of the consulting that you do with brands is also with Instagram. Are some of these things applicable on the other side of the fence? Amanda Bond: They are. And Instagram excites me because it's still undervalued. The CPM's over on Instagram will blow your mind on what's possible, especially within stories. Now, I feel like I have been saying this for a few months, so more people are venturing into the stories world. And Facebook just released a new ad format where they take the creative that you just typically put in the timeline and the blur the edges of the images to actually fit the story's vertical frame. And then the copy that you write in your traditional timeline ads over on Facebook, it's now scrollable within Instagram stories. So that's new, I believe I've seen that only within the last week. But before that, you had to have your images and you had to have your videos optimized for that Instagram story format. So it was really underutilized, therefore, it was really cost effective to advertise over there. We're talking three dollar CPM's which is absolute insanity. But the fun thing on any new platform, or any platform that is undervalued, I love seeing people implement is really asking yourself how do people use this platform? Instagram's completely different than Facebook. On stories, people are now starting to swipe up, they're wanting to feel like it's more interactive and immersive. So you have to ask, how is my customer base and my audience base interacting with me on this platform, and what can I do to stand out on a platform like Instagram. We have this one person who is just having so much fun visually branding themselves on Instagram and using it as a micro blog. So taking things they would normally turn into their blog and creating stories and highlights on it. And so now, we're experimenting with swipe up to go check out my profile, or DM me so that we can talk about this product that you're thinking about purchasing. So in the closed phase, actually encouraging people to start a sales conversation in that sales retargeting phase to have people ... Really have that human experience. So you can have some fun over on Instagram, especially with the DM feature and how people are already using the platform. Adam Brown: As you talk to people who are coming to your programs and to the companies you're consulting, are you seeing them beginning to, because of the points you brought up, a three dollar CPM. That's nothing short of incredible, that's probably not even true even today if we go on because you're exactly right, it's probably gone up. Are you seeing customers allocating more of their spend, A, to just digital marketing and social marketing in general, and specifically, are you gonna start to see customers who are taking money from Facebook proper and sending that over to Instagram? Recognizing, again, the money's all going to the same place. What mix, and transition, and trend are you seeing for ad dollars being the spend and allocated to these different platforms? Amanda Bond: Well, fun fact first, I actually used to sell print media before I was a social media manager. I was in the print media side of the equation. But it was when digital was getting so popular, and every single time I'd go into an account to be like, "Yeah, let's talk about this mail in." I'd be like, "Please don't spend your money on a mail in, please don't spend your money on a mail in." Come over here, digital is gonna be the way. So looking back all those years ago, I was like, "What was I even thinking?" However, chatting with a Facebook rep, this is the insight that they gave me. We don't necessarily want to create ads that are individual placements. So I, personally, do this right now, I'm gonna fully admit it, where I'm gonna create and ad set where it's just an ad on the right hand column, or it's just an Instagram stories ad, or it's just a newsfeed ad. I like to separate things out just because I want that specifically to serve up in that placement with that formatting. Now, after talking with an account rep, their recommendation was not to do that, to use the all placements function more often. And the reasoning that they gave was if we have a limited amount of ad inventory in who you're trying to target. Let's say your target audience size is a million, and let's say the Instagram stories ad inventory is higher, but you're only betting on right hand column, we can't serve up that impression cost effectively to you. So his recommendation was to just choose all placements, let Facebook auto optimize along the way sot that they can figure out which inventory's available and then serve it up. So how does that make your Facebook verse Instagram ad spend allocated in different ways? Well, in that case, you're giving power over to Facebook to actually make the decision based on the available inventory. Adam Brown: And there's some trust there. Amanda Bond: And there's some trust there, right? Hey, the inventory's cheap, we're gonna serve it up over there. I'm not fully on board with it yet. Of course, I always like to go in and spend a few thousand dollars and just text the heck out of it to make sure my theories still stand up. So I'm in that process now where we're testing head to head different placements that I'm choosing and optimizing for. And then all placements, and seeing the performance of those. So I guess you guys will just have to come hang out on the Facebook page afterwards and see how that performance goes. Adam Brown: Facebook/theadstrategist. I think we've definitely heard that looking at using multiple inventory, multiple flat platforms is valuable. I'm gonna add one more layer to this question. In advertising and marketing, we've always talked about [inaudible 00:33:09] pillars and campaigns. And there's two camps, for old school marketing, it's like, "Okay, you need to do always on marketing. You need to be trickling, you need to be sending these messages, you need to have re-awareness, retargeting, but your customer needs you throughout the year, 365 days a year to hear from you." And then there's the other camp that says, "No, you over saturate the market, people being to mute you mentality, you need to have [inaudible 00:33:32] pillars and campaigns. As it approaches and as we approach digital and social marketing here, Amanda, and with the strategies that you're talking about right now, do you recommend to you customers that as they look a their annual marketing or communications budgets, that they try to spend it on big quarterly flights or pillars, or that they should really try to build that engagement, build that authenticity? And probably leaving the witness with that word by doing things more throughout constant drumbeat cadence type of programming? Amanda Bond: Definitely the latter. It's my belief that it's important to have those consistent touchpoints. But now more than ever, we're empowered to not just always serve up marketing messages. That's where the fatigue comes from, where it's like, "Buy this, do this, do that." We can create value and use our ads, our paid media, to serve up that value, to really create brand evangelists, people who are interested in what we have to say. Not only when we're wanting them to purchase. So I do believe in allocating an ad budget that's fairly spread out throughout the year. Of course, if you're launching a new product or a new campaign, you're going to allocating a larger budget to that. But you should be consistently getting out in front of an audience. You should be consistently expanding your audience and growing those custom retargetable audiences throughout the year. So I believe that it's important to just be consistent so that when you do have a new launch or a new campaign that's coming out, then you've already put in the work to build that audience, you've already put in that work to build that know, like, and trust factor along the way. Adam Brown: I wanna switch gears here a little bit and talk a little bit more about The Ad Strategist and how you're structured right now. With your current agency structure, you use a lot more contractors and per project consultants, and trainers. And I'm interesting in what that industry looks like now. A lot of our listeners are like that. They're working gigs and they're working engagements as individual consultants and practitioners in the social media space. And I know I would as well as they would appreciate you perspective on that because you're on the other side of this. You're hiring these contractors, you're hiring these individual contributors for individual types of projects. What does that industry look like now, Amanda? And when you're bringing these people on board The Ad Strategist, what attributes, what talents, what skills are you looking for in those individuals. Amanda Bond: So like you said, it has changed quite a bit as we've changed the model from more of an agency. And the biggest thing that we're hiring for these days is in a project based capacity. So it's not necessarily an ongoing contractor that we're constantly on retainer with, but we're planning months ahead to say what needs to happen in the business, what's coming down the pipeline, and then identifying specialists who know copy writing, or who are ghost writers, or content writers, or graphic designers. And really looking just for that project. And now, I have a few thoughts on it because I also am a contractor that works with companies. So not being in person and not having that employee relationship, it obviously has its pros and cons. I would love to have my team close to me here in Toronto because there's something about the synergy of being in the same room together and strategizing and brainstorming all these things. It just brings a special kind of magic to it. However, businesses are changing, and morphing, and adapting. And that's why the contractor side of things is so advantageous for us now because we can make our projections for the year, we can say this is what's coming down the pipeline, and then just line up the projects with a start and an end date. Of course, some of the contractors that we work with, we continuously work with them for projects and they know what's coming down the pipeline. But as a business owner, that's how I'm making decisions. I'm saying, "Okay, this project is gonna have this scope. Here's our projections for it, here's our resources allocated to it." Let's bring this to life, but it does have that start and end date which is different than if I had a full team here in Toronto. Which, of course, is my vision and goal because being behind the computer all day, sometimes, you go a little bit coocoo. Adam Brown: Yeah. You sometimes need that personal interaction. Adam Brown: I can agree more. What you're doing with The Ad Strategist and your entire career, I think, is fascinating to me. It's fascinating to Jay, I know it's fascinating to our audience. How did you get to this point of creating The Ad Strategist? I know you're also an instructor for Hub Spot, you're a correspondent for Social Media Week. I eman, you are, without a doubt, the credentialed expert in this space. Real quick, how did you get to this point in your career? What advice and tips would you give to other people who would very much like to be like you? Amanda Bond: Yeah. I love talking about this because most people think it just happened overnight, but there was a lot of failure that happened along the way. Decades of failure. I've been an entrepreneur since I was little. Literally hustling handmade bracelets in my elementary school, just flipping them for a dollar. I'd be making bracelets and then be like, "Here." So back in the day, I was always that entrepreneurial minded person, but always in sales and marketing. So looking back, I did have a niche from the start and it was just a matter of going in, trying something, seeing what worked. I did some network marketing along the way, that didn't work. I then went in and did corporate sales and marketing. I was great at it, but I didn't love that corporate atmosphere personally. So then, what was my next parlay into the social world? Social media manager. And it was just a matter of really doing my research, really listening to amazing podcasts like this to get information, and then getting in the trenches and testing it along the way. After social media manager, of course, we transitioned into The Ad Strategist. But all of that work was compounded over time to be able to get to this point where I can confidently be spending thousands of dollars of Facebook ads a day and not blink. I wish it just started there, however, it was a process. And I guess that compounded with just me opening my mouth and sharing everything along the way. I'm a big believer that we shouldn't hoard or gate our genius and our content, we should really share it. Sure, I'm smart with Facebook ads, but I'm gonna share some nugget of inspiration with somebody who's then gonna take that, they're gonna sit on it, they're gonna ruminate on it, and they're gonna turn it into something even more beautiful than I'd ever be able to create. And so it would be selfish of me to not share that information, but it was just that process that got me here. By just showing up and sharing is what gave me the opportunity to become a hub spot academy instructor along the way. And to go film on Forbes and talk about Facebook ads because I was just willing to do it from a really ... Place of here, I'm gonna pour it out and just share the value that I have. Adam Brown: And doing it, as we can see here with a level of enthusiasm, with a level of passion and excitement about the topic. And I think that's so important, whether you wanna be a social media pro or a practitioner, anything else. You've gotta love it, you've gotta be interested in it, you've gotta have this quest for more knowledge and recognize that the entire process is an educational one. Amanda, we're gonna end with the two big questions that we ask every guest on the show. You've already answered one, so I'm gonna put a little wrinkle on it. Amanda Bond: I feel like this is a test. I'm getting nervous all of a sudden. Adam Brown: I don't know. We're all kind here, so you have all the time in the world. And I know you will have great answers for this. Question number one, you just shared some insights, so I want you to distill it down to one thing. But what is the one thing that you would suggest to someone wanting to become a social pro like you? What's one tip? Amanda Bond: No matter if you see the results of what you're doing today, keep taking the consistent action day in and day out. Plant those seeds today and trust that you are planting for a future harvest. That is the hands down thing that gets me through the hard times. Adam Brown: I love that. Keep the funnel full of ideas, of resources, of leads, no matter what it is. Second question and last question, Amanda Bond, owner founder of The Ad Strategist. If you could have a Zoom video call with any living person, who would it be and why? Amanda Bond: Immediately, my mind went to Elon Musk. Adam Brown: Okay. A popular answer. Amanda Bond: A popular one, right? But I don't know why it's going in that way. Have you seen the show the men who built America? Amanda Bond: Okay, so my recent thought process is who are the characters, the men who built America of today? And so I was having that conversation. I'm like, "Is it Buffet, and Gates, and Jobs, and Musk?" And so I was thinking that in my head, so I might just get on Zoom and see his perspective on that. I don't know, maybe I just wasted a Zoom call. Adam Brown: I don't think so, Elon has been a very popular person. And as we record this show at the end of July 2018, a little bit of controversy around the man. Jay is a Tesla owner, I'm a Tesla owner, we're big fans of the man. And it's gonna be interesting to see how he gets past this next challenge? But we would love to have him on the show as well. Amanda Bond: That would be great. Adam Brown: Amanda, you have shared in these couple of minutes, some great insights for us and for our listeners. Thank you, I hope our listeners will head over to The Ad Strategist and find out more about what Amanda is doing over there. I for one wanna thank all of our listeners, each and every one of you for listening to our show. It means a lot to Jay and I. And again, we hope that you will share your thoughts with us. For Jay, this is Adam Brown from Salesforce Marketing Cloud. Thank you for listening to the show today. Jay and I will be back next week for the next episode of social pros.